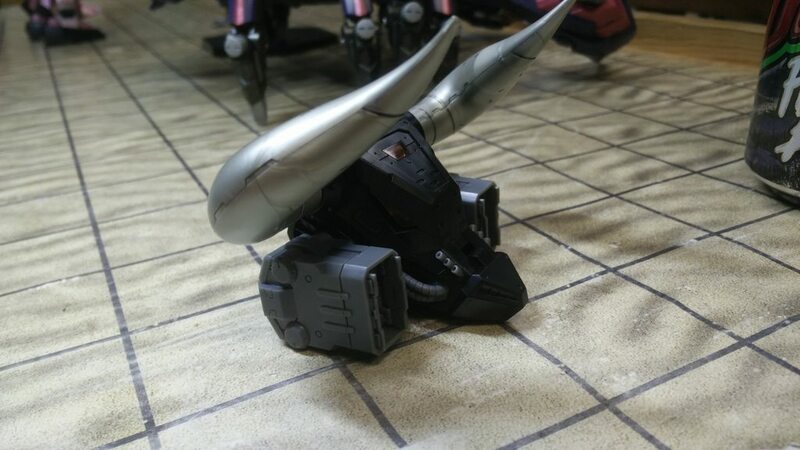 Hah, I didn't notice it before Athenor's latest post, but I like how that zoid has a gun on the... beak? nose? ...like it has a cigar sticking out of one side of its mouth. Other times, it is a machinegun. I don't know if it is a small cannon or not. 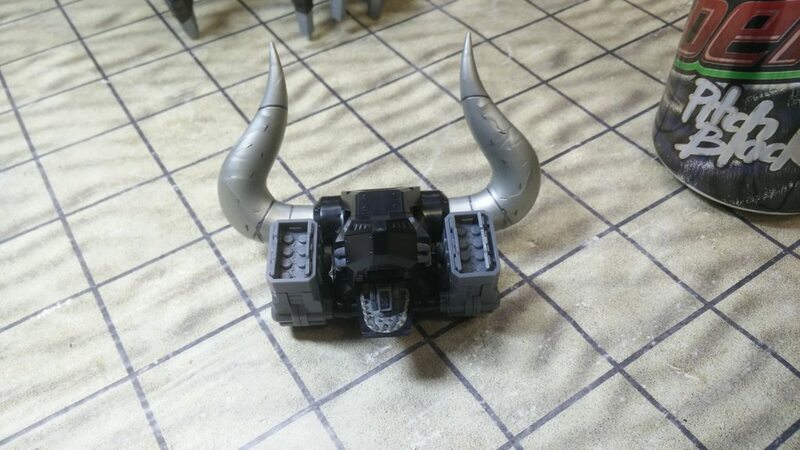 The early zoids all had a similar, swappable cockpit design - you can see the same design on the snake Zoid too.  Anyways, they all have that little jutting out part. In fact, you can just make it out on the original model. That little sucker is the piece I'll most likely need to glue in. It wants to fall out all the time if I apply even the lightest pressure to it. IIRC from the GBA game by default it was an energy weapon but you could swap it out for other things. 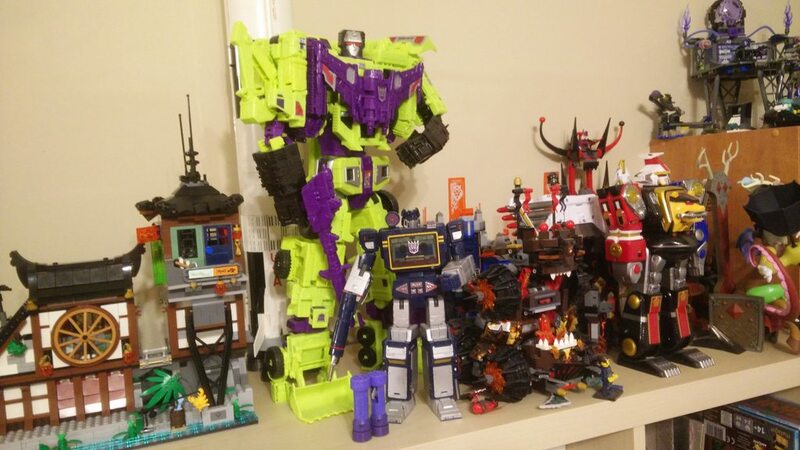 Was out to lunch with my wife yesterday when I noticed my local hobby shop was having a 20% off sale. "I wonder if they have any gunpla?" Who makes the best spray paints for gunpla? I got a kit for my birthday (an Endless Waltz Altron) and wanted to try laying down the base colors with spray paints. Now I have the Tamiya US site open and oh nooooooooo I want all of this. But yest their acrylics are fantastic, and I can only assume their spraycans are incredible as well. Or light it all the time and mimic the inescapable grip of entropy. You know, eventually. 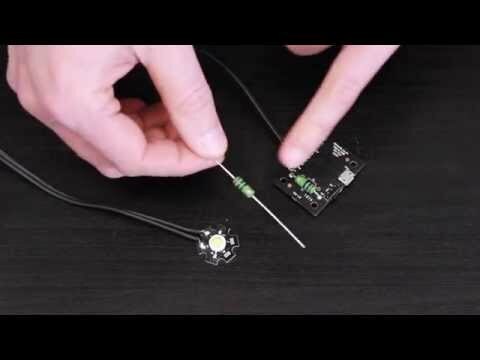 Speaking of lighting, I’d very much like to find a way to install tiny LEDs or something similar that doesn’t involve tiny batteries with short lives. Just I ran into how can I change the battery or make it turn on and off so I ran into a lot of problems and theory. I don't know how they do it in gunpla designed with light-up features in mind, maybe they design in a place to access the battery? Given that kickstarter for wireless lego lights above a baseplate, I am surprised no one has done similar for gundam. Things like the MG RX-78-2 (I think the 2.0, 3.0 and Origin types) have the torso and head designed so you can slide the head off and pop a small self-contained LED unit in there; just pop off the backpack, back armor and slide the head/neck assembly off it's slot and slide in the LED. Bruh, 25 months at $65/month? So you've gotta wait over two years just to get all the parts, and you pay $1625 all up? Bandai do a nice 1:48 model (over 10 inches long) for a hundo, and Revell do a 1:29 model (over 17 inches long!) 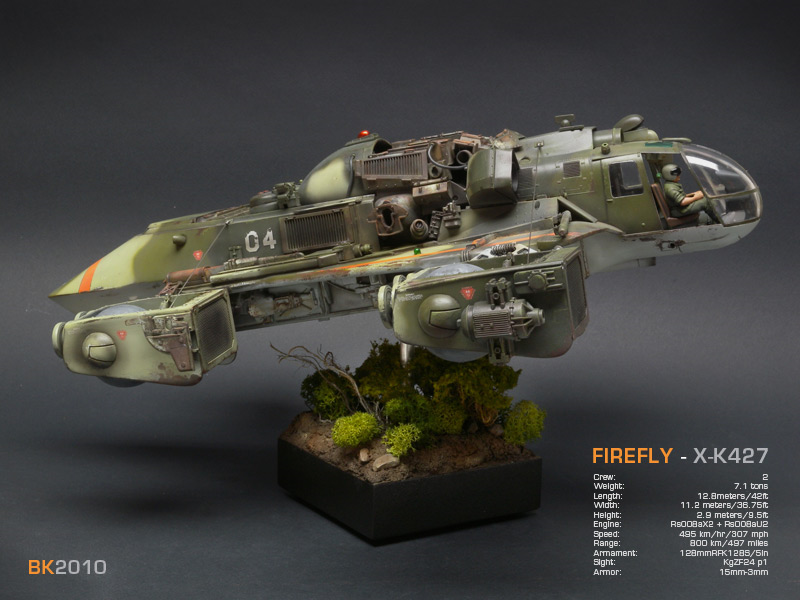 that is aimed at a younger crowd but still looks nicely painted and detailed for ~50 UK pounds. Yeah, it's expensive, and time consuming, but the amount of detail in these kits is insane. If you're super into modeling, and super into Star Wars, and desperately need a hobby for the next two years, $65 a month isn't too much. It's not for me, I don't have the painting chops or the patience to do a kit like this justice. But for someone who does? Sure. @Brainleech dont leave me hanging!! 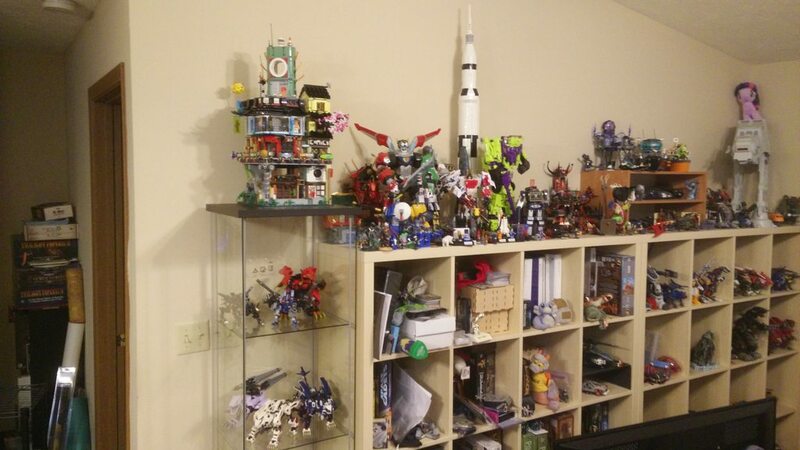 Does Lego count in this thread? 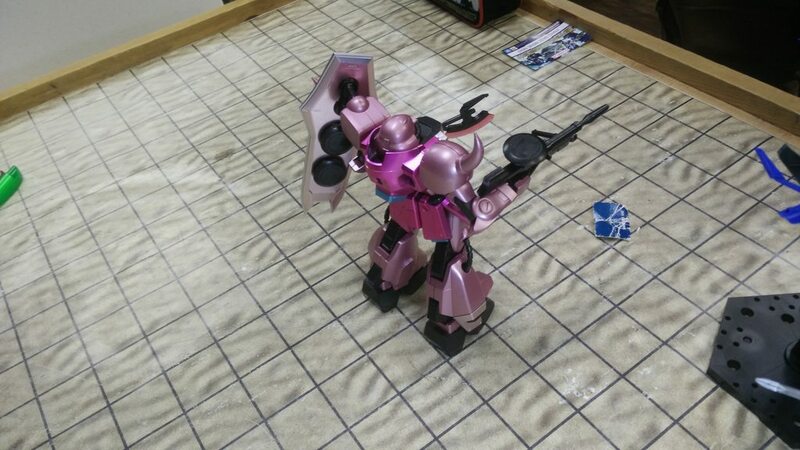 What about if there's a gunpla in the picture? 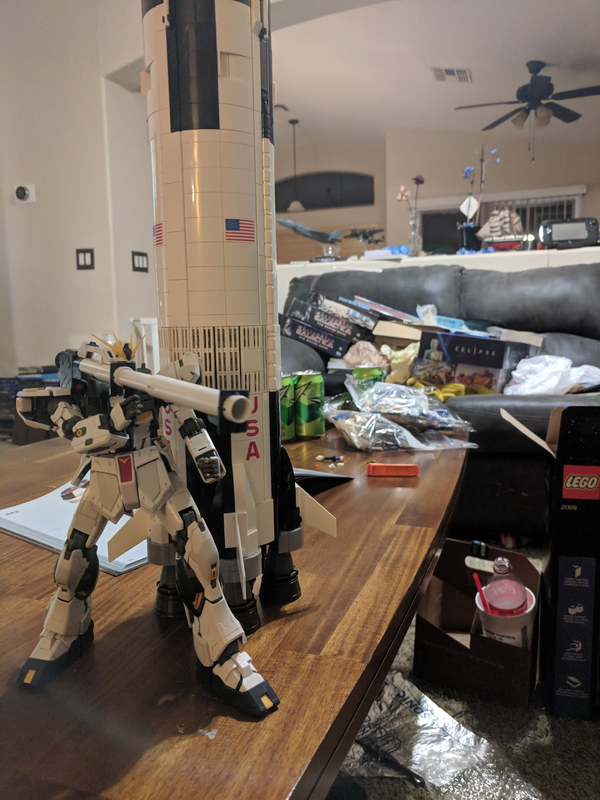 I just wanted to show the scale of this thing.. it's approx 1/110 scale.. so close to a MG. Concerning LED lighting without wiring, I noticed my “local online shop” has that X-Base lighting set, which allows LEDs to emit light via induction, without wire, but it is expensive! The display base (with 10 white leds) is 180€, and a box of 10 LEDs (either 10 blue, red, green or yellow) are available is 35€! I suspect that the $1650 model costs more than what LucasFilm and ILM spent on the original X-wing model. Anyways, we do have a Lego thread over in D&D if you wanna gush there too. 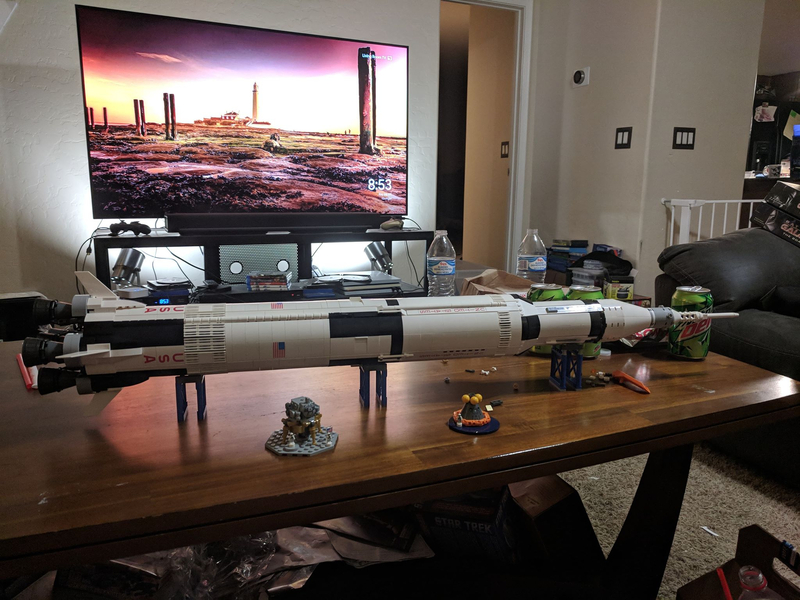 The Saturn V is an amazing kit. And yes, finding some place to display it's a bit of a bear. Psst @LogicReason throw your trash away. I keep a trash can next to my work space for just this reason. I'm not so much interested in wireless lighting per say as I am in a way to drop a light or two in an MG without much trouble and plug it into a power source with a switch that doesn't involve me having to screw with batteries if I leave it on for more than an hour or so. My first build was the MG RX-78-2 The Origin version, and it has a cavity for the Bandai Gundam LED unit, which is functional but is also the origin (sigh) of my battery complaints. Conceptually, I could see an easy way to fit a light with a small wire that leads to a flush, external-facing AC adapter-style plug on the back of the MG in that cavity, and then...something...involving an AC adapter, a power switch, and whatever you need to step down the incoming power to manageable levels. Maybe build it into a central thing with multiple outputs that can run out to multiple endpoints, and some fun effects options for pulsing or blinking or whatever. I imagine you could customize something light that, but the fact that I described most of the inner workings as "...something..." leads me to believe that I shouldn't fool around with it. That powerful of an LED would make the plastic glow. Which, mind you, would be a cool effect! Yeah, but I was just showing it off as an example of a USB powered LED that could be installed into a Gunpla. She runs an instagram account and promotes female gunpla and model building and such. She also showed me a REALLY amazing portable lightbox setup that I have to get now. She arrived after me... and built that entire model in the same time it took me to build the head of my Dibison. 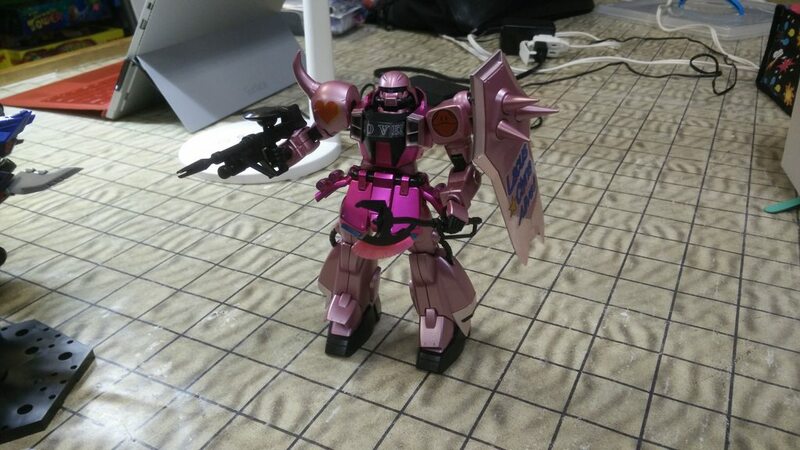 That's a gorgeous Zaku. I love the shine on it. It CAME like that. With the painting of the shoulderpads and shield and everything. 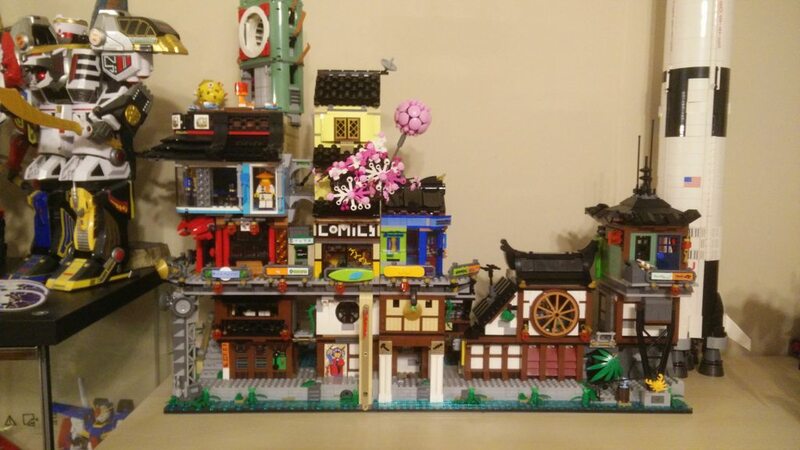 She didn't say how expensive it was, but it's a set from 2007 and apparently incredibly rare. I'm guessing the metallic version is a p-bandai/lucky draw kind of deal. That one is also hg 1/144. The metallic one was 1/100 and technically not rated. Edit: Found a reddit post about it. It's from the C3 Chara Hobby Expo 2007, originally sold for 4,500 Yen. Apparently super rare but also not in high demand, but as this was a completely new kit I'm sure it went for more to find. 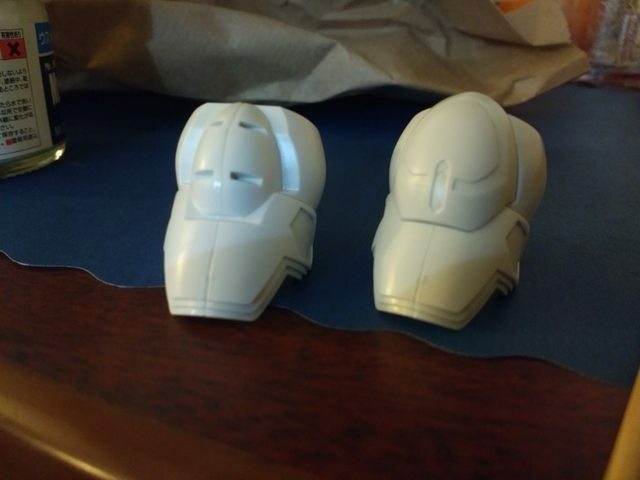 Lil' Barbatos update, here's the seamlines removal! The shoulders are the only part of the kit I'm removing the seamlines on. The frame has a few that might look good, but I'm concerned about how much detail needs to be painted while it's unassembled, and fusing stuff together might make it too hard. The shoulders are that right level of convenient and noticeable to make it worth doing, IMO! 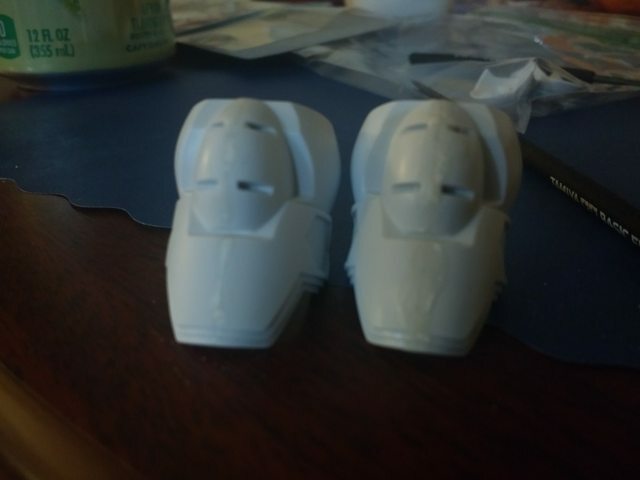 So here they are yesterday, I fused the parts together using model cement, that melts the plastic a little to get a solid connection. Then comes Mr Dissolved Putty! This stuff is great, like every other Mr Colour product I've used. It goes on goopy, dries pretty quick and then is hard as plastic 24 hours later. The one on the left has been sanded down already, the one on the right is how the putty looks after drying. Used a nail file to grind it down a little, and then Tamiya Finishing Abrasives 1000 and 2000 to get it smooth with the plastic. There is not much room to grind down on these pieces, though! The ledges at the bottom are less than a mm each. Might need another pass to get the tiny little seams on the bottom ledge, but I think I'll prime these first, see if Mr Surfacer 1200 will take care of it. The putty is basically just plastic cement mixed with plastic, so when you're done you have a plastic bond. I have the same stuff except Tamiya branded.